DiskLab for Android – Wonderful Data Recovery Software for Android Powered with the latest data recovery engine, DiskLab for Android is fully capable of scanning all deleted or lost data from Android phone or tablet. The recently upgraded algorithm makes the data recovery process 10 X faster. Very frustrated when you deleted some important file? Don't worry! No matter what kind of the reason caused data loss, Tunesbro Android Data Recovery allows you fully restore them with minimal effort. You won't have to worry about that as the tool will supports all types data loss, the reasons may be accidental deletion, device factory reset, corrupted SD card or system crashes. You just need to go through 3 simple steps to recover any lost, formatted data on your android device. Recover all kinds of data made by accidental deletion, wrong operations, etc. Restore different types of lost data due to unexpected app, system crashes etc. Retrieve deleted or lost files from corrupted or malfunction SD card or USB drive etc. Recover erased or wiped data because of factory reset, ROM flashing etc. 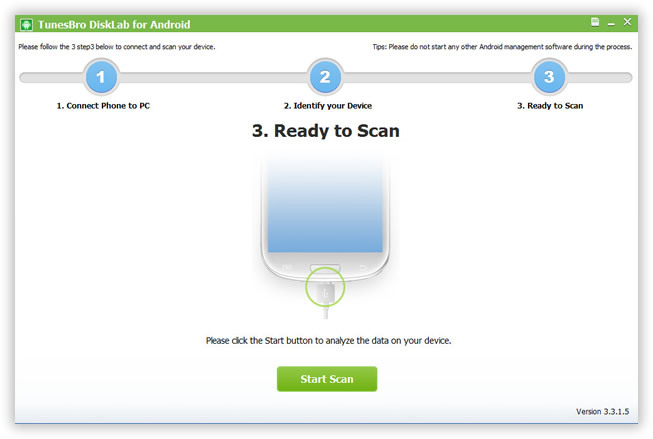 DiskLab for Android is the most powerful yet user-friendly Android data recovery program designed for Android users. 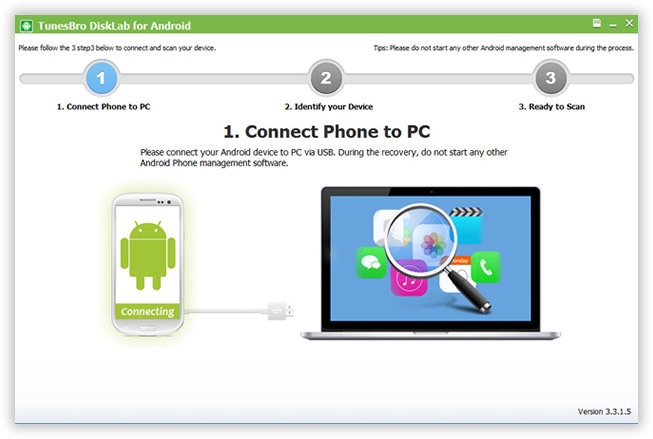 The recovery task can be done in a quite easy way: connect your Android device to pc, scan it and select the files to be recovered.Only a few clicks away to get back your valuable data! File type support is one of the most important factors for data recovery programs. 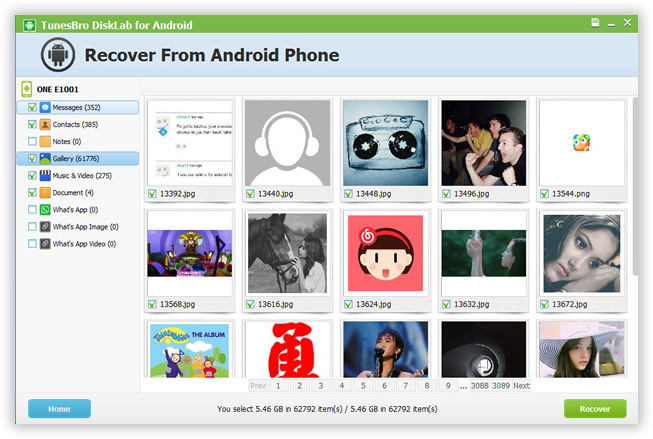 Tunesbro DiskLab for Android is able to recover up to 17+ types of files from Android phone or tablet. This is the feature that distinguishes its from competitors. Don't worry about the security of your personal data. Tunesbro Android Data Recovery will never collects any data while scanning your device, it only scan and show your data and help you recover them. 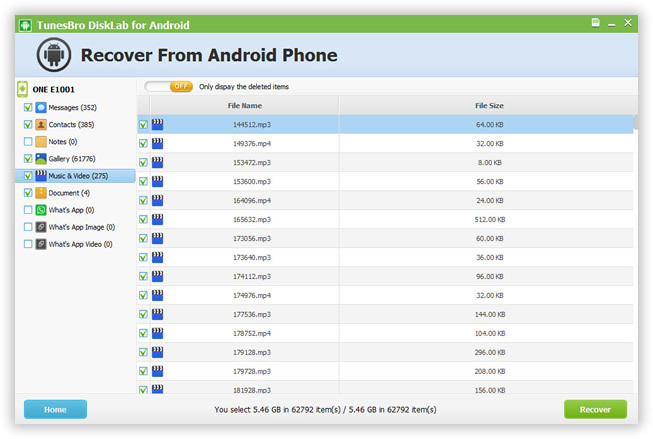 DiskLab for Android supports a wide range of file types, making its an extremely useful tool for data recovery. You don't need to worry about what kind of files being deleted. The recovery is assured. When the deleted data being scanned by DiskLab for Android, you have two choices: fully recover all of them or just recover the selected ones. In most of the cases, you only need to restore the ones you care about. And there is no reason to recover the ones that have no value to you. You can preview each of the item or file before data recovery. This makes sure you only recover the necessary data or files. And leave the useless ones remain deleted. Android devices from running 2.0 to 6.0 are well supported by DiskLab for Android. It can recover lost data from 300+ manufactures and 2000+ Android devices. Galaxy S8, S7, S6, S5, S4, Note 8, Note 5, Note 4 etc. U11, One M10, M9, M8, M7, E8, Desire EYE/510/520 etc. G6, G5, V10, K10, G4, G3, G2, G Flex 2, G Pro etc. Pixel, Pixel XL, Nexus 6P, Nexus 5X, Nexus 10, etc. Xperia XZ, XZP, UA, XA, X, Z5, Z3, C4, M5, M4, E4, etc.
" As a careless smartphone user, I don't worry any more for data loss because DiskLab is ready for help when the bad thing happens. It successfully recovered my deleted contacts and tons of family photos due to system crash. Highly recommended to anyone who wants to restore their lost data."